Filler Cup Inline. 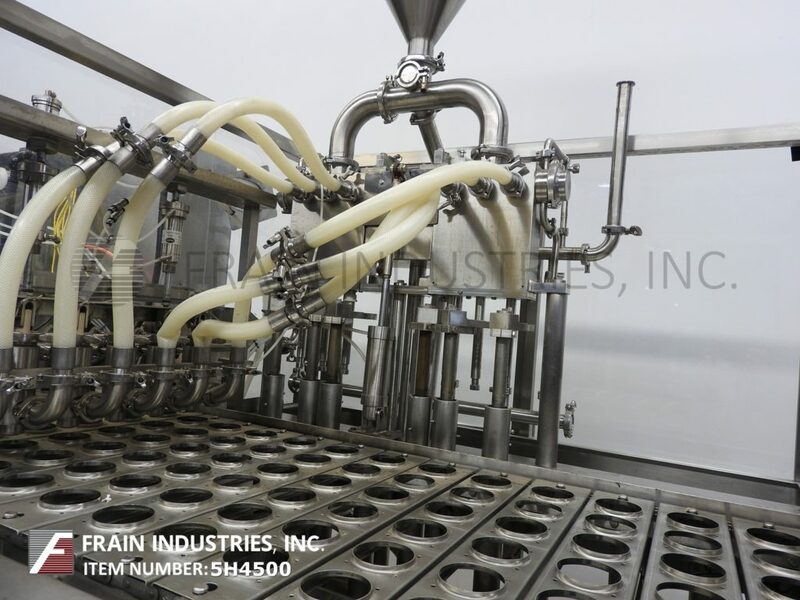 An inline cup filler fills and seals cups using straight line tooling to index cups. The machine de-nests cups, indexes the cups below the filler where the cups are filled, indexes the cups below the sealing head where the cups are sealed, and indexes the cups to the discharge station where the cups are discharged. Multiple lanes of cups to be processed simultaneously by this type of machine (depending on original machine configuration) allowing for greater machine output. 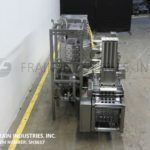 Machine can be outfitted with either pre-cut or roll stock film seals, overlid applicator, and different filling heads for different types of products. 2 Lane, automatic, inline, stainless steel, 2-up cup filler, roll stock film and heat sealer, with number of cups per minute – depending on materials, application and machine configuration. Container size and fill range per are application with proper change parts. 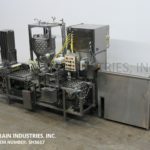 Equipped with 307" long x 14" wide empty cup conveyor, 2-up configuration and has 14" long x 4" wide empty cup carrier plates with (2) 3-3/8" ID cup pockets set on 6" centers and dual 16 pocket rotary empty cup magazines has dual end roller cup denesters with overhead covers to (6) 3 each side Roto Fol 2000 rotary product feeders with no container / no fill and brush box, roll stock film rollers has dual (4) head heat film sealers and 36" long (3) eagle belt discharge conveyor. Remote control panel has A/B controller with board A/B panel view controls with 1 and 2 lane also 1 to 4 head Watlow heat sealer controllers with film on / off and speed control dials with start, reset, stop and e-stop push buttons. Mounted on heavy duty stainless steel base frame with casters and leveling legs. 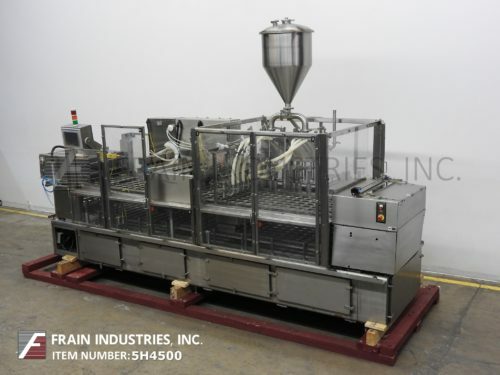 Automatic, stainless steel, intermittent motion, cup filling sealing and over lidding machine rated 10 to 40 cups per minute – depending on materials and application. Cup size: up to 7" in Diameter; up to 6" in Height. Fill size: up to 90 oz. 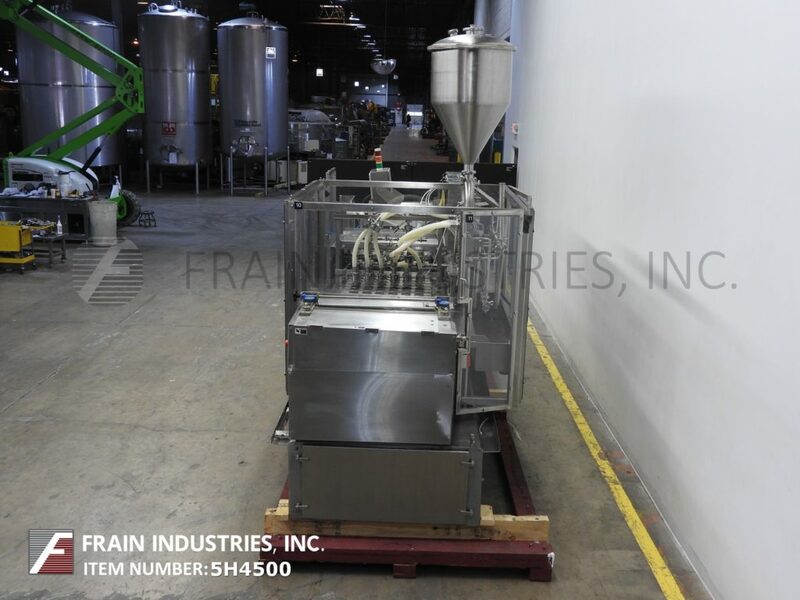 Equipped with a 36" empty cup magazine, 2 chain carrier system, AMS auger filler, tamper evident sealing station, 36" long over lid magazine, recipricating vacuum pick and place, stainless steel discharge chute, swing arm control panel with A/B Panelview, A/B PLC, and interlocking stainless steel guarding. Mounted on locking casters. Automatic inline cup filler capable of speed 5 to 30 cpm, depending on product and applicaiton. Equipped with 10 gallon product hopper, cup denester, 128 oz piston w/ cut-off nozzle that is capable of fills between 28 and 140 ounces, over lidder and discharge. SS & aluminum construction. Mitsubishi PLC. Automatic two lane cup filler rated up to 60 cups per minute – depending on materials and application. Includes cup de-nester, two filling stations per lane (enables filling two products into one cup), film heat seal station and over capper. World Cup Model 2-up, automatic, inline, stainless steel, cup filler, roll stock film and heat sealer, with number of cups per minute – depending on materials, application and machine configuration. Container size and fill volume per application with proper change parts. Equipped with 84" long x 7" wide flex link empty cup conveyor with (4) rotary head cup denester has start, stop and e-stop push button controls, to empty cup diverter conveyor to dual accumlation empty cup conveyors has cup aligners with single head cup loaders to 238" long x 8" wide, 2-up configuration cup transport conveyor has 12" long x 4" wide empty cup carrier plates with (2) 4" OD cup pockets set on 6" centers, (2) 5-1/2" ID x 8-1/2" deep stainless steel funnel style product hoppers and roll stock film rollers with (2) film heat sealers. Control panel has A/B controller with lane 1 and 2 heater on / off switches and heat controllers advance film and stop button with e-stops and has 58" long dual 6" wide discharge conveyor. Mounted on stainless steel base frame. 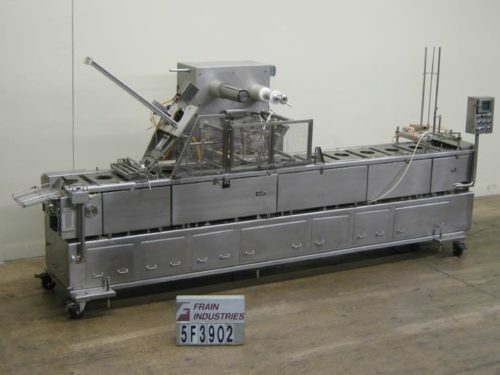 Autoprod / Oystar, Model CMS 4×2, automatic, stainless steel, dual lane, two up, cup filler. Rated from 60 to 240 containers per minute – depending on materials, application and machine configuration. Container size range to 4" in diameter and 4" in height. Equipped with 31" wide x 15" long x 24" deep product hopper, cup denester, (8) 9 oz pistons and rotary pic-n-place die-cut sealer. Control panel with an A/B controller and A/B PanelView touch screen HMI. Autoprod / Oystar Model FP2x1, automatic, stainless steel, single lane, two up, cup filler. Rated from 10 to 60 containers per minute – depending on materials, application and machine configuration. Container size range to 5" in diameter and 5" in height. 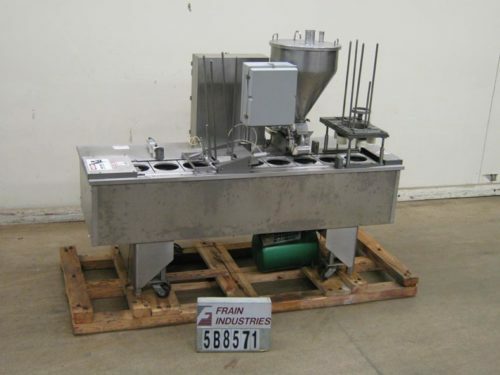 Equipped with 18" wide x 16" long x 18" deep product hopper, cup denester, (2) 32 ounce piston with rotary valve and positive cut off nozzles, roll stock heat seal station with re-wind and reciprocating pick and place overlidder. Control panel with push button start / stop, on / off switches and digital temperature controls. Mounted on heavy duty stainless steel base frame. Can be used with either paper or plastic containers. Autoprod / Oystar, Model FP 4×2, automatic, stainless steel, four lane, two up, cup filler. Rated from 80 to 240 containers per minute – depending on materials, application and machine configuration. Container size range to 2" in diameter and 2" in height. Equipped with 21" diameter x 18" deep jacketed product hopper, cup denester, (8) 2 oz pistons and roll stock heat seal station with re-wind. Control panel with push button start / stop, on / off switches and digital temperature controls. Mounted on heavy duty stainless steel base frame. Modern Packaging, automatic, inline, stainless steel, 1x 5 pattern, cup filler, pre-cut die film applicator and heat sealer with dual slitters. Rated from 40 to 200 containers per minute – depending on materials, application, machine configuration and proper change parts. Container sizes and fill volumes per application. Equipped with cup denest, 180" long x 21¼" wide container conveyor with 1 x 5 pattern container plates, no container / no fill, pre-die cut film pic-n-place and heat sealers with dual slitting stations. Control panel with power on, start, stop, e-stop controls and statis light bar. Mounted on stainless steel base frame with drip pan and interlock safety guarding. Change parts required to accommodate size range. 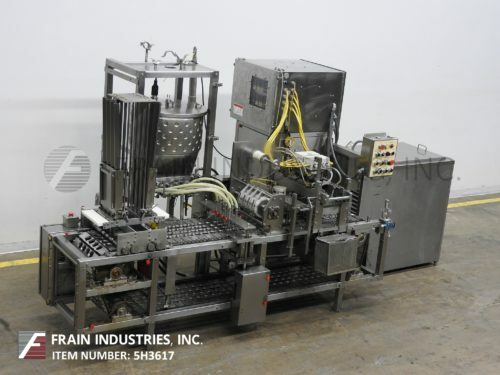 Automatic, intermittent motion, stainless steel, 4 x 1, cup filling / sealing / lidding system rated up to 80 to 180 cups per minute – depending on materials and application. Cup size: up to 5" in Diameter; up to 6" in Height. Fill size: up to 41 oz with proper changeparts. Equipped with cup magazines with denesting stations, 5 ft³ product hoppers, 16 oz pistons with rotary valves with positive shut off nozzles, bottom up fill, sealing station, over lid magazines with reciprocating vacuum pick and place, stainless steel discharge chute, interlocking Lexan safety guarding, A/B PLC, and a push button control panel with visual displays of double cup, cup drop, low air pressure, low film, heater alarm, motor overload, door open, discharge jam. Addiditional indicators include heat seal pressure and knife pressure guages. Mounted on height adjustable legs and casters.